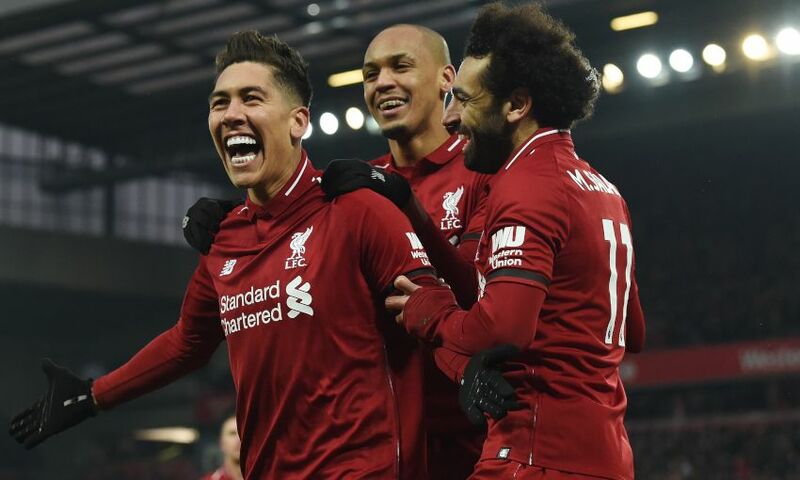 Liverpool strengthened their advantage at the top of the Premier League table with a dramatic 4-3 victory over Crystal Palace at Anfield on Saturday. In a hard-fought encounter, Andros Townsend gave the Eagles the lead on 34 minutes when he finished off a counter-attack by converting Wilfried Zaha’s low cross from close range. Mohamed Salah equalised immediately after the restart, touching in Virgil van Dijk’s deflected strike, before Roberto Firmino put them in front moments after. James Tomkins headed in a leveller from a corner just after the hour; however, Salah claimed his second when he tapped in from on the line after Julian Speroni had misjudged James Milner’s cross. Milner was shown a second yellow card with a minute of normal time left to play following a challenge on Zaha, but Palace’s hopes of salvaging a point were ended when Sadio Mane netted in stoppage-time. There was still time for Max Meyer to reduce the deficit for Roy Hodgson’s side, though, but the Reds held on to go seven points clear ahead of Manchester City’s trip to Huddersfield Town on Sunday. Liverpool made three changes from the team deployed at Brighton and Hove Albion one week ago for the contest. With Trent Alexander-Arnold and Georginio Wijnaldum ruled out due to injury, Milner and Joel Matip returned – as did Naby Keita in place of Xherdan Shaqiri. Liverpool marked the recent passing of Peter Thompson as well as what would have been the legendary Bob Paisley’s 100th birthday next week ahead of kick-off before they set about trying to extend their lead at the Premier League summit to seven points, with Manchester City not in action until Sunday. They fashioned their first opening in the eighth minute when Milner collected a half-cleared corner and slipped a pass through for Matip; however, his close-range swipe was foiled by Speroni. Palace were content to sit deep and try to absorb the hosts’ pressure – and after Firmino had clipped over the crossbar, Mane planted a header straight at the goalkeeper from a corner. Next, Matip nodded wide from another set-piece and Van Dijk looped a header onto the roof of the net via a deflection. But Liverpool were left stunned just after the half-hour when Palace took the lead with their first meaningful attack as a counter resulted in Zaha crossing low for Townsend to sweep beyond Alisson Becker from eight yards. The Reds’ dominance of the ball continued following the setback, but Palace stood resolute and took a one-goal advantage into the interval. Liverpool eased any anxiety by mustering the perfect start to the second period. Van Dijk took aim from distance inside the opening 60 seconds. His strike looped up off a Palace defender and fell in the direction of Salah, who was able to turn it beyond Speroni from the edge of the six-yard box. Suddenly, the decibel levels were cranked up inside Anfield and Andy Robertson drew gasps from the Kop as he arrowed a low shot inches wide of the post. Nevertheless, the Reds completed the turnaround in the 52nd minute. Palace’s clearance from a corner made its way back to Firmino inside the area. The Brazilian stepped inside Tomkins and found the bottom corner via a deflection off the visiting defender. However, it was Tomkins who drew the Eagles level once more when he headed in from a corner 12 minutes later. Jürgen Klopp responded by sending on Shaqiri in place of Keita – and Liverpool regained the lead soon after. Fabinho hoisted what’s quickly becoming a trademark pass towards Milner’s run to the back post on the right. The vice-captain managed to nudge it into the middle, where Speroni misjudged its flight and inadvertently directed it towards his own goalline, allowing Salah to arrive and tap in. The home team were reduced to 10 men when Milner saw a second yellow card for a challenge on Zaha on 89 minutes, setting up a tense finale. Two goals in five minutes of stoppage-time saw Mane nudge Liverpool further ahead before Meyer grabbed one back for the Eagles as the Reds held on to tighten their grip at the top of the table.